In the ever-changing world of SEO, it’s important that you revisit your SEO and content marketing campaign and assess what has been working and what has been struggling. Successful marketers understand that SEO and content marketing is about more than blindly building links or mass-producing content simply for the sake of it. Using a data driven approach, marketers can create targeted, effective campaigns that help their businesses attract, engage and retain customers while building authority and generating demand. Without understanding the current state of the industry, content marketers will struggle to develop effective strategies that will drive results. Here are some SEO and content marketing statistics, tailored for Australian content marketers in 2019. Search Engine Optimisation is key to any digital marketing campaign in 2019. Unfortunately, SEO is often overlooked for “quick-win” marketing options, however, it’s hard to deny the value of ranking well and attracting large amounts of organic traffic. Here are some statistics that show the importance of SEO in 2019. Of course, understanding how consumers are using search and engaging with content is important, but as marketers, it’s also important to understand the platforms this is all happening on. Here’s what search engines and social media platforms look like in 2019. Google continues to be the powerhouse of the search world and even increased its market share by around 1% in 2018. 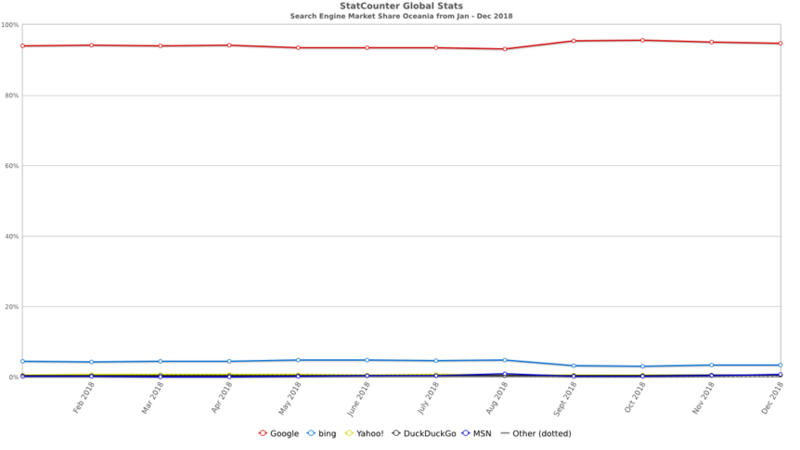 Bing on the other hand saw a decline of about 1% and new player DuckDuckGo is slowly making growth that’s worth keeping an eye on. With almost all internet searches originating on Google, it’s important for content marketers to understand how search engines work and to be privy of any updates which might affect how their content ranks on the search engine results page. Even as Google moves to mobile-first indexing, majority of Australian users are still on desktop. Mobile is not far behind, and with growth in things like voice-search, it’s likely that desktop will struggle to hold its dominance. 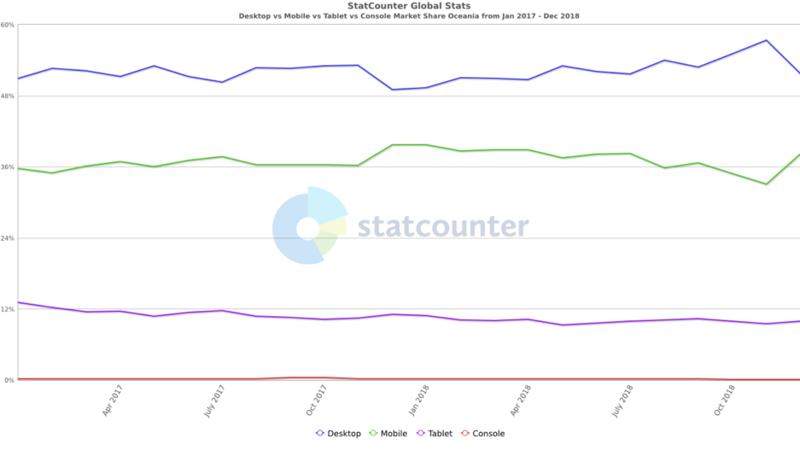 These statistics show that while it’s crucial to focus on a mobile friendly site, both for users and Google’s mobile-first indexing approach, the desktop experience is still important. It’s worth noting the drop in desktop and the simultaneous rise in mobile usage around November and into December. Interestingly, this pattern occurred in both 2017, and 2018. Being aware of patterns like this can help you get a step above your competition and reach more of your customers. 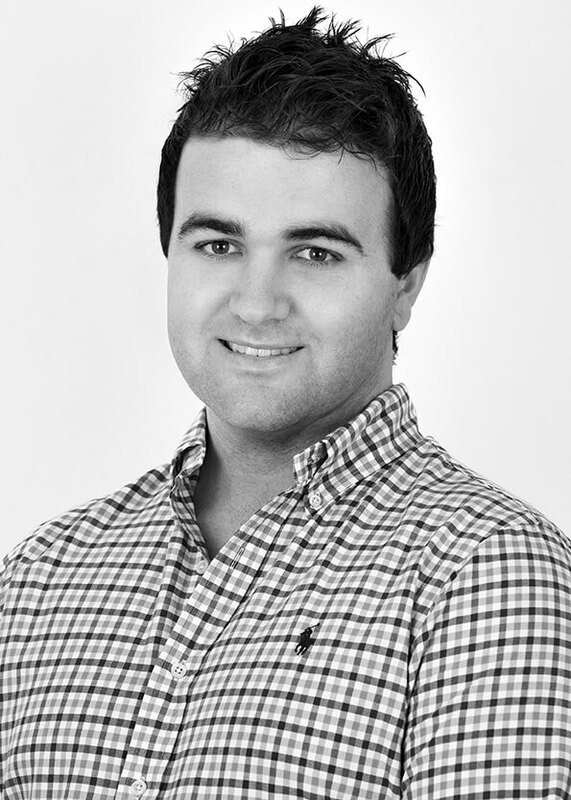 Social media continues to be the channel of choice for content marketers and users alike. According to the Content Marketing Institute 2018 survey, 90% of Australian marketers use social media posts for marketing purposes with 56% of marketers agreeing that social media is the most effective in helping their organisation achieve specific goals. The above groups of statistics clearly show why marketers are focusing on social media platforms and specifically Facebook. With 15 million monthly active Facebook users, over half of Australia’s population logs into the social media platform every day. Not a bad place to promote your content. On the other hand, these statistics show that 2nd and 3rd tier networks like Flickr, Pinterest and even Reddit are yet to catch on with mainstream use in Australia. The benefits of using social media as a marketing channel in 2019 should not be ignored. Research what social media platforms your target audience is using and hone in on these sites. These statistics are just the tip of the iceberg when it comes to content marketing, however it’s easy to see how incorporating data into your content strategies can help you find success. In 2019 we will be sure to keep an eye on new and emerging trends in the marketing world.